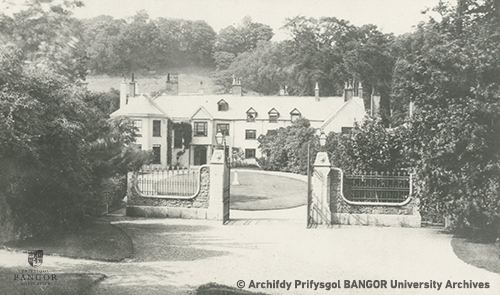 Postcard photograph of the main entrance to the ‘Bishop's Palace,’ Bangor, c1890s in date. ‘The Bishop's Palace,’ which became the Town Hall in recent decades, dates to the mid 16th Century. Most recently The Gwynedd Museum and Art Gallery, ‘Storiel’, relocated to the building, opening its doors to the public on the 30 January 2016. From the R.T. Pritchard Collection. If you have any photographs in your possession which you think might be of interest to the Archives and Special Collections, please do not hesitate to get in touch! Visit our website http://www.bangor.ac.uk/archives or our online catalogue http://calmview.bangor.ac.uk/Calmview for further information about our collections.